High ethical standards in business and professions; the recognition of the worthiness of all useful occupations and the dignifying by each Rotarian of his occupation as an opportunity to serve society. The advancement of international understanding, good will and peace through a world fellowship of business and professional men (women) united in the ideal of service. The Estherville Rotary Club was organized in 1938 under the sponsorship of the Algona Rotary Club. There were 18 charter members. The first officers of the club were George W. Thompson, President, Deemer Lee, Vice President and Henry W. Mahlum, Secretary-Treasurer. The Charter Night was held April 22, 1938 and was attended by more than 200 persons from Algona, Pocahontas, Spirit Lake, Fairmont, Humboldt, Forest City, St James and Emmetsburg. The Charter presentation was made by District Governor Wm. R. Brandon of Davenport. Early meetings of the club were held in the old dining room of the Gardston Hotel, at that time being a large room in the southeast corner of the hotel. After a year or two the hotel remodeled a room in the basement, calling it the Green Room. This became the meeting place until further remodeling produced the Shore Room on the first floor. The club continued to meet in the Shore Room, except for brief periods at the Estherville Country Club and Elks Club, until the hotel closed in 1977. The club moved to the Six Fools Inn until that too closed in 1979. Then temporarily, to the Cardinal Café before finding a home at the V.F.W. Club in 1979. Sponsorship of a Rotary Club at Spencer, Iowa, by the Estherville Rotary Club was a well remembered event. Many members of our club attended the charter night on January 20, 1948. The tenth anniversary of our club was celebrated on March 22, 1948, at the Skyline Club in Estherville. Rotarians, their ladies and guests, were regaled by Dr. Russell B. Lindskog and his presentation of the Mysteries of the Atom. Observance of th 20th Anniversary occurred on April 17, 1958. Members, Rotary Anns, and guests were entertained at Vern and Coilas Club at Lake Okoboji. The twenty-fifth anniversary was observed in the Shore Room of the Gardston Hotel on March 28, 1963. Rotarians, Rotary Anns, special guests, including Rotarians from Spirit Lake, Fairmont Algona and Spencer were in attendance. Deemer Lee presided as Master of Ceremonies. The program consisted of Recollections by Deemer, special group songs direct by the Rev. Jack Wolter, comedy intrusions by Mike Lund, Germany and Tomorrow by Peter Kreppel, Foreign Exchange Student from Ausburg, Germany and Melodies of 1938 by Kay and Karen Klinger. One of the note-worthy events in which our club participated was the co-hosting of a District Conference. Under the leadership of the then District Governor, Ben Phillips, District 597 held the District Conference in April of 1960 at the New Inn of Lake Okoboji. Co-hosts were the Estherville, Spirit Lake and Spencer clubs. The conference was the first to be held in the Convention Hall at the New Inn, completion having been rushed to accommodate the conference. Co-chairman of the conference were: Paul Bramlett of Spirit Lake club, Delbert Hinsch of the Estherville Club, and Bill Pepper of the Spencer Club. A number of the members of the Estherville club were involved in the principal activities of Publicity and Attendance Promotion as well as other duties and activities in connection with the conference. Of particular note was the fine effort of Ernie Robinson in promotional work. At the Governors Banquet on Friday evening, Deemer Lee of the Estherville Club served as Toastmaster, with the principal address of the evening being given by Judge Harold D. Same Kessinger, Past Director of Rotary International entitled Architects of a Better World. Support has also been given to the Rotary International Foundation, providing college fellowships in leading countries of the world. In the school year of 1963-64, Robert Lee, son of charter member Deemer Lee, was selected by the foundation to attend the University of Marseillese located in Aix-en Provence, France. The decade of the 80s brought a new resurgence for the club. Attendance improved, membership increased, and new activities abounded. This rebirth started under the leadership of Tom Hoien and Jim Wiant. Two outgoing Exchange Students, Beth Kirk and Christine Anderson, have studied in Australia. We have also hosted several incoming students. We have sent a t least one student to the International Affairs Seminar at Whitewater, WI every year since 1984. Steve Doty was our representative on the Group Study Exchange to New Zealand and Bob Grems was sent to Scotland. We have hosted teams from New Zealand, Argentina, and Scotland.Prior to the Kansas city Convention we hosted a Homestay from Nigeria and from England. Two high school students have been selected each year to attend Iowa Lake Community College on scholarships provided by the Rotary Club. Our club has received the Presidential Citation every year since it was first awarded in 1983-84. We have reached the 3800% level of giving to the Rotary Foundation. The club now has 46 Paul Harris Fellows (six multiple and 3 triple) as well as 12 others who are sustaining members working toward their Paul Harris recognition. We have pledged and contributed $15,000 plus to the Polio Plus undertaking of the Foundation. Diversity: Rotary was originally very strict with vocational classifications. This brought about diversity in all clubs, including ours. Members from all walks of life made meetings more interesting. This requirement has become less and less important over the past few years, but still provides us with a real cross section of our community. Attendance: Rotary is more than a luncheon club. In order to be a good Rotarian and to be of service to the club and community you need to have good attendance. Naturally there are times when we can't attend, but it should be every members goal to attend as often as possible hopefully 75% of the time. Witness the number of members we have that continue to have perfect attendance. Attendance is more lenient now, with Board Meeting make-ups as well as other club make-ups. (Try them you'll enjoy them). Participation: During the year there are numerous projects that our club is involved with to assist the community. You should become involved in some or all of these events. Your participation helps you, helps the club and helps the community. If the same few are involved in all activities they cant be as successful as if all of us pitch in to assist with these events. District Events:Previously our club would often have 10-30 persons attend District Meetings. We found a great deal of fellowship and fun in these trips as well as meeting many other Rotarians from around the district. Although some of the old timers presentations aren't always stimulating, there are enough fun events to overcome any that aren't. 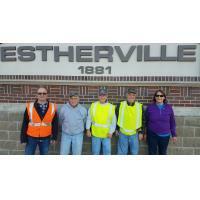 Mike Hamilton of our club is the only member from Estherville that has had the distinction of being District Governor of District 5970. It is quite an honor and a lot of work so congratulate him again. There are also District committees that may be of interest to you, get involved. Group Study Exchange Teams: We have hosted a number of teams. Those that come to mind are 1981 New Zealand, 1989 India, 1999 Austrialia, 1970s Japan, Scotland, Argentina and 2005 Bavaria. We were also fortunate to have Steve Doty and Bob Grems chosen as members of outgoing teams to New Zealand and Scotland. Student Exchanges: Rotary has an excellent exchange program. We probably don't take advantage of it as we should. The main reason is the difficulty in finding sponsoring homes. Mike Hamilton also works in the District with this program. We should also encourage local students to work toward outgoing visits to their nations Both the GSE and the Student exchanges promote great international understanding that lasts for years and effects many people here and abroad. 2005 we will have a student heading to Thailand. Rotary Foundation: Each member and club is encouraged to contribute to the Rotary International Foundation. It is one of the most efficient charitable organizations in the world and funds a multitude of international projects. Polio Plus is the biggest project, having raised in excess of $600,000,000 world wide over the past ten years and being joined by governments and United Nations efforts. As a Paul Harris Fellow, your $1,000 contribution will aid many people around the world. The endowment is great and the income from these funds benefits many. Club Service, Community Service, Vocational Service and International Service. Where can you help?